So it’s August, aaaaand – herbs. I’ve got lots of herbs. In pots. In baskets. Outside my front door. And I’m in that end-of-season panic of what to do with all the herbs. This is brilliance, my friends. 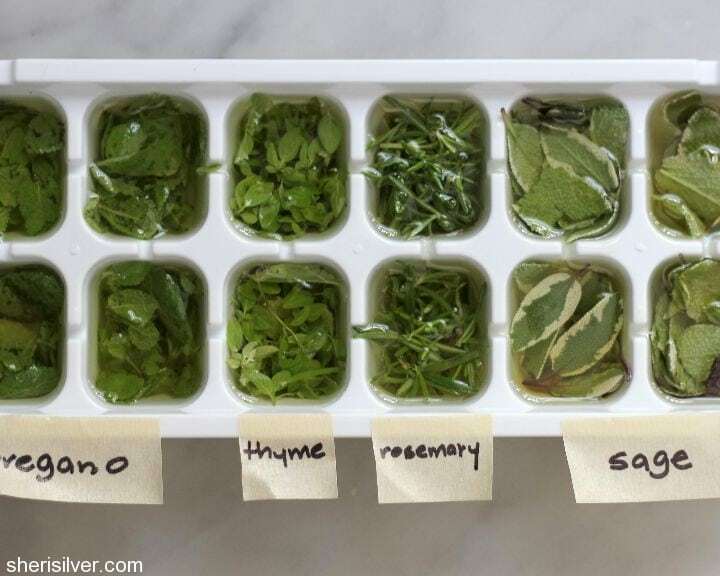 First of all, this method virtually eliminates the freezer burn that occurs when placing herbs directly into the freezer. Second – and even more importantly – it preserves that fresh-herb flavor even better. And it couldn’t be easier. 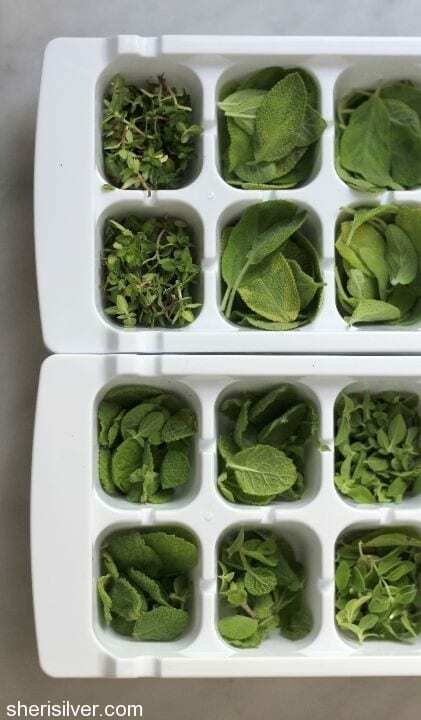 Simply snip your herbs and fill the compartments of your ice cube tray. Add whatever oil you like to cook with, and pop in the freezer. If you’re freezing multiple varieties, a little “label” – made with some masking tape and a Sharpie – will keep everything clear. 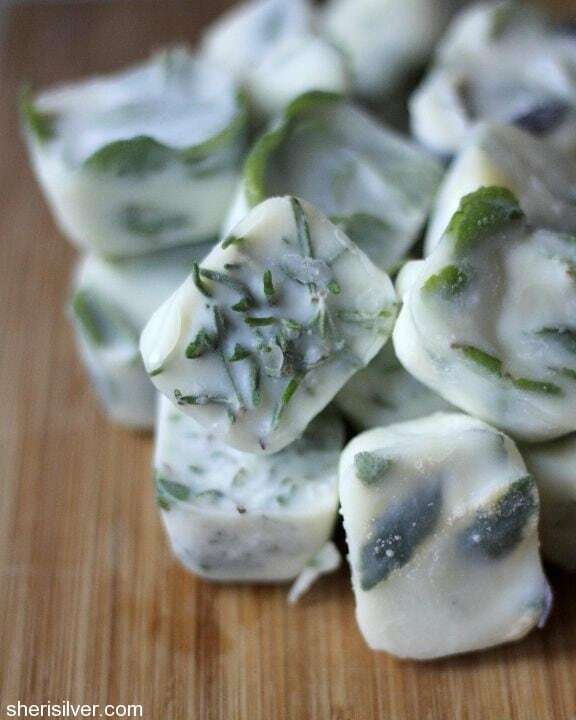 Place your herb “cubes” into a ziploc bag and label. To use, simply take a cube (each cube has about 2 tablespoons of oil; make note of how much yours contain) and place directly into your skillet, roasting pan or Dutch oven. Saute or bake, infusing your ingredients with the taste of fresh picked herbs – in February! 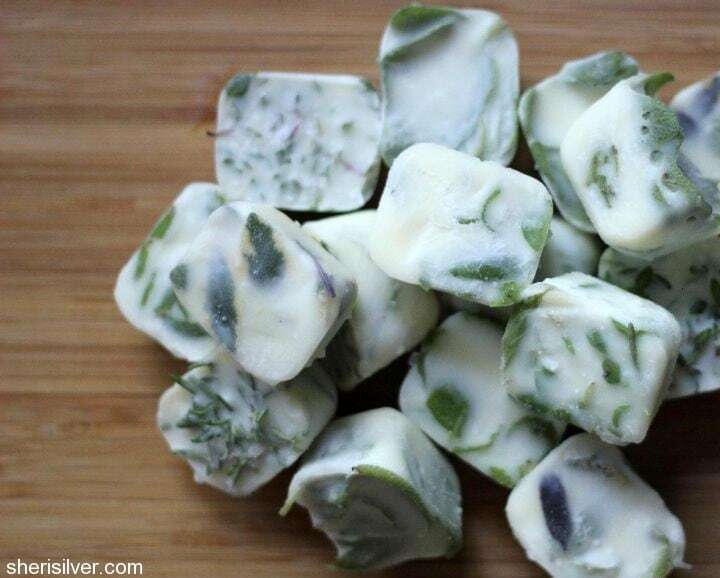 Which herbs freeze best? The ones that you would typically cook with – rosemary, thyme, sage and oregano are my favorites. Have you ever used this method? What do you think? Brilliant as usual! I also never use up what I purchase in the winter. This’ll help hugely with not wasting. This is BRILLIANT. Sheri, my mom has an herb garden and she is going to DIE over this idea. Love this idea!! Thank you so much! I am “oil-free” so will just use water, but now I am worried about your comment regarding freezer-burn taste. You are absolutely correct! Ugh!?? Again, thanks for posting fabulous idea!! 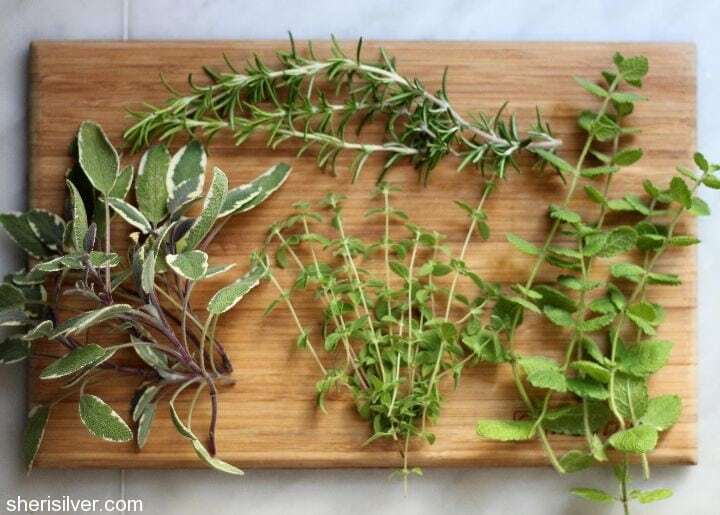 Thanks for allowing me to link to this post in my ‘what to do with a bunch of herbs’ round up!